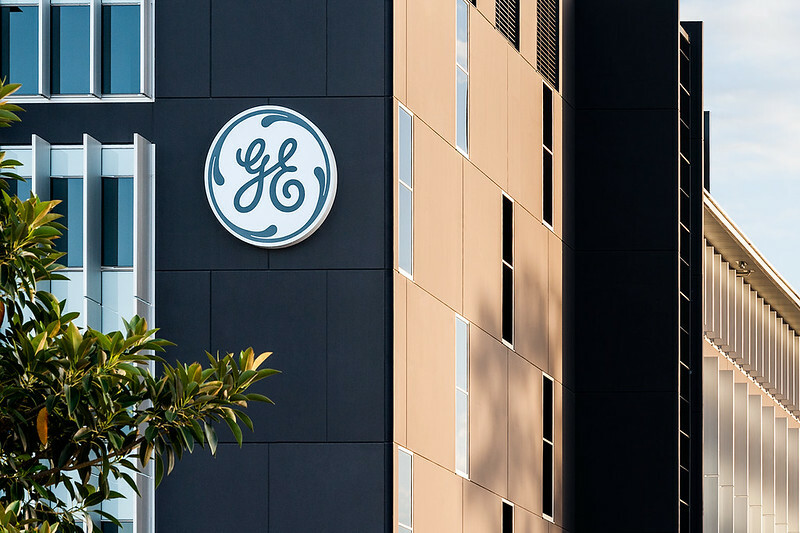 Austral Precast concrete panels proved to be a bright idea for building GE headquarters in Springfield, Queensland. 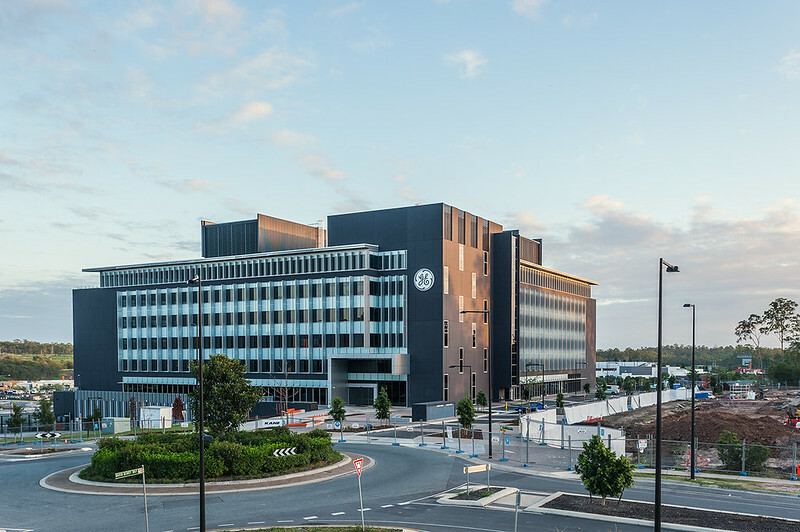 The project in Springfield, now the headquarters for General Electric, was constructed using precast concrete solutions and installation expertise from the team at Austral Precast. As Australia’s largest supplier and installer of innovative precast concrete solutions, Austral Precast was chosen after a competitive tender due to extensive experience in commercial construction. The GE HQ required a suitably experienced precast concrete supplier to provide a range of tailored solutions, from the green star concrete panels required to reach energy efficiency targets, through to project management skills required to fit within a tight installation schedule. In all cases Austral Precast delivered. To achieve the goal of reaching a 5 star Green Star rating and 4.5 Star NABERS rating Austral Precast offered a solution in the form of green star concrete panels which reduce the need for heating and cooling by adding thermal mass to the structure. The panels, which are made using reduced cement levels in concrete and recycled water, reflect a shift in the construction industry to giving greater consideration to the environment, both when constructing buildings and in their ongoing operation once built. As a result, Austral has expanded the scale and scope of its business to embrace Environmentally Sustainable Design Initiatives and the changing economic climate of the market place. Their precast concrete panels are manufactured in each plant throughout Australia under strict environmental guidelines. Emissions from the pre-fabrication plants are monitored in accordance with government guidelines and as a member of the National Precast Concrete Association of Australia the company and its skilled employees are helping to promote the special environmental benefits of precast concrete. When achieving the goal of fitting within a tight installation schedule, precast concrete was an ideal choice. Because precast concrete is manufactured off site and made to client specifications, manufacture and site preparation can occur simultaneously with quick and straight forward installation. This ensures faster enclosure of the structure, minimal delay to work being carried out by other trades, and limited site congestion with no delays resulting from external weather conditions. For the GE HQ this meant installation on time and with minimal fuss, all under the meticulous gaze of Austral Precast’s installation team. Easy and fast installation is just one of many benefits that makes precast concrete an ideal construction material and which has seen its increased use in the high rise residential, commercial, and industrial construction. Along with outstanding durability resulting from the use of concrete in various densities and compositions, precast concrete is a strong, low maintenance, cost-effective material that will endure the ravages of weather, time, pollution, and other external forces with minimal degradation or damage. To assist in reducing the ravages of weather, time and pollution, external precast panels can be pre finished with Austral Precast’s innovative PermaTint finishing system which applies a solid colour that is warranted for 25 years. Available in a vast range of monotone colours and unique colour effects, PermaTech offers great advantages over on site colour applications like painting because PermaTint actually penetrates into the panel’s surface for a more stable, longer lasting colour finish. PermaTint is also applied during manufacture so there is no need for additional trades on site to colour panels.